The University of Maryland is partnering with St. John Properties on a proposed development in Riverdale Park that will include flex research and development space. 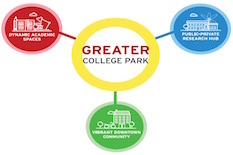 This project builds on the momentum of the University of Maryland’s Greater College Park initiative, an ongoing effort to rapidly revitalize the Baltimore Avenue corridor and the surrounding campus. “This partnership will provide the Greater College Park area with new Flex/R&D buildings, offering companies a flexible space to build and grow their business,” said Edward St. John ’61, founder and chairman of St. John Properties, Inc. The project, comprising 10.37 acres, will include 111,240 square feet of flex research and development space within two buildings. The buildings can be configured to meet the needs of hundreds of different business requirements, with the goal of attracting businesses in key sectors of engineering, data analytics, earth sciences, virtual reality, cybersecurity and more.